Water Pearls UK - Beautiful substitute for water in your flower & candle arrangements. 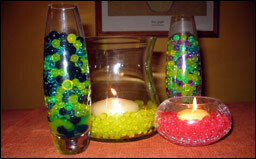 Water Pearls add an extra dimension to your candle and flower arrangements. Simply add to a clear vase or bowl for extra colour and vibrancy. Use for those special centrepieces at Dinner Parties, Weddings and Birthdays. Water Pearls make the ideal substitute for water in your flower arrangements. Use hydrated Water Pearls instead of water to add that extra colour and beauty. Water Pearls help to extend the life of your cut flowers, however when they do die, simply rinse the pearls, let them drip dry and re-use. Low light plants such as Bamboo and Spider Plants can grow directly in Water Pearls. Alternatively put a layer on top of the soil in your pot plants to provide colour and retain moisture. Water Pearls come in many beautiful colours. 1. Soak pack contents in 1pint of water for 6  12 hours. 2. Place Water Pearls in a sieve and allow to drip dry for about an hour. 3. 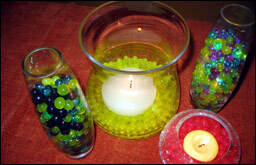 Place Water Pearls in a vase or bowl and arrange flowers and candles accordingly. 4. No additional water is necessary for cut flowers as they will absorb moisture from the Water Pearls. 5. Water Pearls will eventually start to dry out, when this happens top up with water to the original level and the Water Pearls will rehydrate. 6. Do Not put spent Water Pearls down your drain, they may rehydrate and block them. 2. If you wish to feed plants, dissolve feed in water prior to soaking Water Pearls. Plants will benefit from the gradual release of water and feed. Do not add feed directly to Water Pearls. 5. Be careful with roses as they need extra water, just add back enough water to cover the base of the cutting. 6. Mix spent Water Pearls with soil in your plant pots to reduce waterings. 1. Qu. I have soaked the Water Pearls overnight, why do they still look like frogspawn? The Water Pearls need draining, allow to drip dry in a sieve for about an hour. 2. Qu. Do I need to add water to my Water Pearls if I am using them to arrange cut flowers? No, the flowers will usually absorb all the moisture they need from the Water Pearls. However roses can be very thirsty, just add back enough water to cover the base of the cutting. 3. Qu. How long do Water Pearls last? Water Pearls can last several years although direct sunlight will shorten their life. If used with cut flowers, you should get about 6 uses. Each time the flowers die, rinse Water Pearls, allow to drip dry and store ready for reuse. When the Water Pearls eventually need replacing, mix with soil to aid water retention in your pot plants. 4. Qu. How do Water Pearls help to extend the life of plants? Water Pearls are porous and cling to the roots allowing plants to extract water more easily than from soil. Roots will not rot as they would if stood in water alone. 5. Qu. Are Water Pearls safe? Yes. They are non toxic and extremely safe. They are made from polyacrylamides which have been around for 30 years and are in widespread use in products ranging from soft contact lenses to sunscreens. However, please remember that Water Pearls are for decorative purposes only and are not suitable for children. Links Spin Collective Extensive collection of wall stickers, decals and wall art.